A 1/34 scale, 1955 Diamond-T full rack stake truck made by First Gear, Inc. 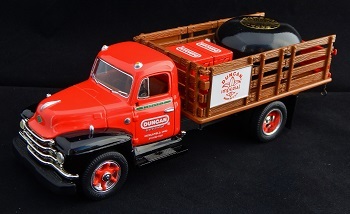 The limited edition toy truck came with a black reproduction 1955 Duncan Super Tournament yo-yo in the truck bed along with four red, plastic Duncan-branded "wooden crates" (that held yo-yos... at least in your imagination). First Gear used this same model of truck but with other custom imprints of companies besides Duncan, such as Texaco, Maytag, Phillips 66, Ace Hardware, and Chevron. Each truck model came with its own miniature plastic, product-specific items stocked on the flat-bed. The particular model in this exhibit was released in 1996. Original retail price: $40 US.